In an effort to make Florida the top state in the nation for education, teachers, parents and administrators all work tirelessly to develop new and innovative ways to stimulate and empower our students. Education is the ultimate key to developing the future leaders of Florida. It will open many doors for our youth and create future opportunities for the state. We want our students to have every chance to succeed. That’s why it is important to recognize the tremendous contributions of business partners throughout the state. Their support enriches education and helps create a brighter future for Florida students. The Commissioner’s Business Recognition Awards (CBRA) program was established in 1987 by the Commissioner of Education. This program recognizes businesses from around the state that have shown the most commitment, creativity and innovation in bringing about positive change to schools and school districts. At the 28th CBRA ceremony, I was thrilled to honor 83 outstanding business partners in education. We are all truly grateful to each business honored with the Commissioner’s Business Recognition Awards. Every gift of time, talent and resources helps to ensure Florida students receive a high-quality education and encourages successful alliances within the business community and among local school districts for the benefit of Florida’s students. It is a great pleasure to see Florida businesses, schools, educators and students working hand-in-hand to best prepare our students for success. Our business partners give students access to mentors, resources and opportunities that supplement classroom learning and give them real-world experience. If we continue working together to give students the best preparation to be successful in college, career and life, I can envision that by the time today’s preschool children are graduating, Florida could be the best state in the nation for education. Thank you, again, to all of our 2015 CBRA awardees for the important work you do on behalf of Florida’s students. You are helping to build Florida’s next generation of leaders and innovators. 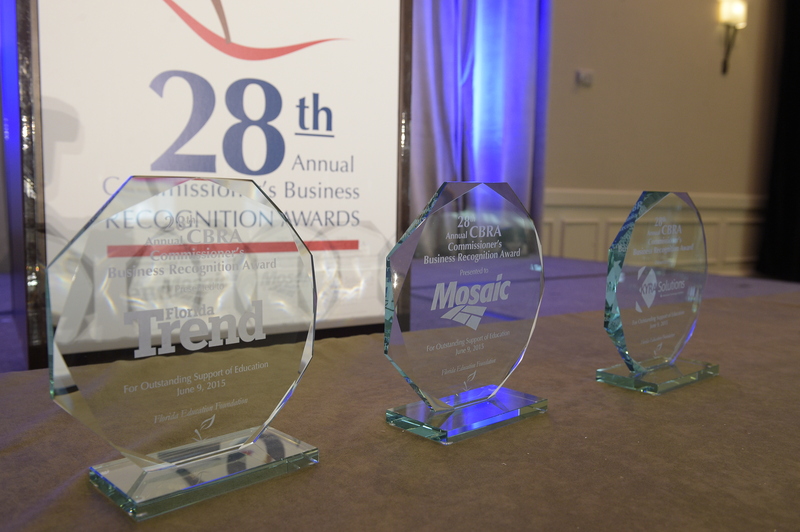 To learn more about the recognition program and to view a list of awarded businesses and organizations, please visit the Commissioner’s Business Recognition Awards.